A 14 year-old U.S. citizen accused of working as a hit man for a Mexican drug cartel was formally charged with murder on Wednesday, February 9th, for the killings of four men whose headless bodies were found in August dangling from a highway bridge. 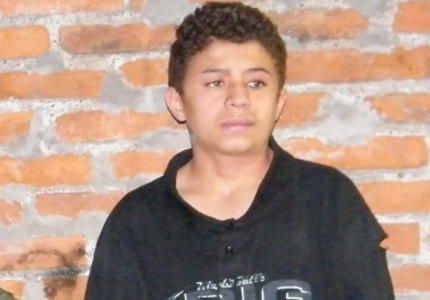 The boy, Edgar Lugo Jimenez, nicknamed “El Ponchis,” allegedly worked for the South Pacific Cartel since he was 11, according to army officials who apprehended him. “El Ponchis” reportedly confessed to beheading his victims while high on marijuana and being threatened with harm if he refused. “El Ponchis” arrest is a shocking example of how Mexico’s youth is increasingly being lured and used by Mexico’s drug trafficking gangs. Narco culture arises as a sort-of narco identity, or cultural hybrid. The prefix “narco” is so common that it is attached to almost any noun to signify some aspect of narco culture. For instance, in recent years drug ballads, known as narco corridos, have been popularized, narco mansions or narco castillos (drug mansions or castles), narco art (drug art), narco tiendas (drug stores, that is, where illegal drugs are sold), narco santos (drug saints, especially Jesus Malverde and La Santa Muerte), and even narco menonitas (drug Mennonites). Thus, violence is not the only product in the fight between the drug trafficking organizations and the Mexican government. Narco culture is a social identity that people involved with the drug war on a daily basis assume. The discussion about narco culture, however, is generally limited to the inner workings of Mexican and border drug trafficking organizations, not Mexican or border culture as a whole. Our goal in upcoming posts is to further explore the cultural aspects of the drug war that involve an important segment of the Mexican population. “El Ponchis” has been charged with murder potentially putting him in jail for a number of years. And while his crime will presumably be punished, hundreds of other young boys and girls are being recruited across the country to participate in the drug war. In this light, it is crucial to begin to understand how Mexican youth like “El Ponchis” begin down the trail leading to the dark world of narco-cultura. *AL DÍA: News and Analysis from the Mexico Institute is a periodic series of exclusive commentaries by respected U.S. and Mexican analysts and scholars on key issues in binational security cooperation. The opinions expressed here are those of the author. To contact the author, email mexico@wilsoncenter.org. Sarah Beckhart graduated from Franklin and Marshall College with a degree in history and is currently an intern with the Mexico Institute.